So who wants to pay more when there’s a less expensive alternative available? Naturally I pick the THRIFTY option…sometimes. I’m talking about name brand products vs. generics/house brands. So I ask myself – are you getting the same product you expect in a name brand when you buy a generic/house brand (because that’s the idea)? Or is it a situation where you get what you pay for, and cheaper isn’t as good. My guess – the answer will be: SOMETIMES. I set out on a mission to find out. NOTE: unless the store has their house brand/generic product on sale (which I didn’t find in my shopping examination), you typically can’t use coupons on generic. (Target does have up and up coupons on target.com, which Lori says can make products DIRT CHEAP. Also, on occasion, Lori has received a Parent's Choice coupon in the mail (Wal-Mart's baby brand). But I did find that even using a coupon on a name brand product left it more expensive than the generic product. If you’re trying out extreme couponing like Lori and me, keep your eye on store sales + coupons and you can, ideally, get it for dirt cheap or free! So that’s a trap-shoot (and let’s be clear that I prefer the term crap-shoot, but Shaun advises me that trap is the proper term for the terra cotta plates you practice shooting your firearm at a firing range + this is a family friendly blog). Archer Farms (Target high end brand), florets: $2.29/16 oz. = $0.143/oz. Market Pantry (Target generic), chopped cuts: $1.24/16 oz. = $0.078/oz. Green Giant chopped cuts, on sale: $1.50/12 oz. = $0.125/oz. Clearly the Market Pantry broccoli is the best buy. And they are a fine product. The key difference is that the chopped cuts are florets plus stems, which are not as tasty. The florets are just the tops, and that is really tasty. So for my family, I always buy the florets. This is a situation where you get what you pay for. Archer Farms Maine berries: $3.99/16 oz. = $0.25/oz. Market Pantry berries: $3.19/12 oz. = $0.27/oz. This is crazy! 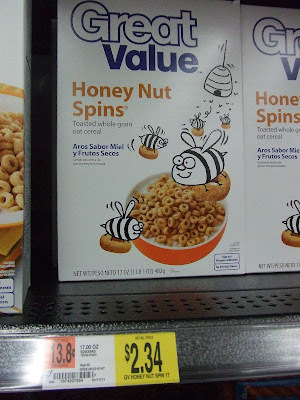 You might think that buying the $3.19 house generic brand is cheaper because the price is lower. 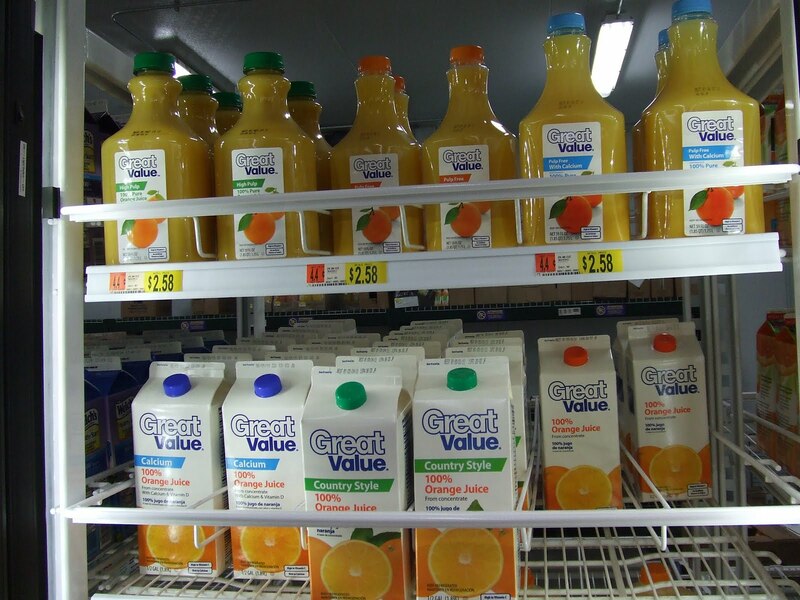 But when it’s calculated, the house high-end brand is $0.02 cents cheaper per ounce. Friends, this is an example of where you really need to be smart and do the math. No difference in the quality of the berries in my opinion. Lucky Charms (name brand), on sale: $2.99/16 oz. = $0.187/oz. Lucky Charms: $3.69/24 oz. = $0.154/oz. Marshmallow Mateys (generic), on sale: $4.59/28 oz. = $0.163/oz. MP Marshmallow Treasures (house brand): $1.89/11.5 oz. = $0.143/oz. Shop smart Friends, and you’ll find the best deal. I’ve found that the taste of all of these generics is great. Friends, there is no difference in taste here. And the MP is fine and a buck THRIFTIER for your budget. Shaun and I purchase the hormone-free, which means that the cows are not given hormones to increase their milk production. I read an article that a study found that these same hormones were found to cause girls to start puberty early. True or not, I really would rather not take the chance until I learn otherwise. Generic skim milk at Wal-Mart in small city, ND! $4.12/gallon! WOW! 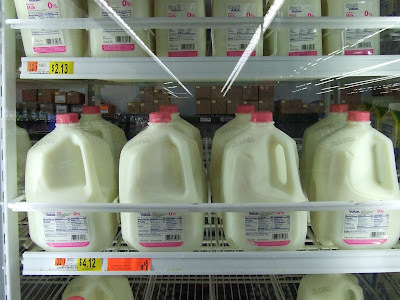 Lori says she ALWAYS BUYS the generic milk! Shaun and I buy the Market Pantry house brand. We really like the taste and the price is THRIFTIER! Doritos, on sale: $3.50/17oz. = $0.21/oz. Market Pantry: $1.74/13oz. = $0.13/oz. In this case, I’ve found that the MP brand does not taste the same as Doritos. I prefer Doritos. I eat them sparingly these days because they are not Quantum Leap friendly. Boo hiss. This difference I couldn’t believe. I use the house brand and am perfectly satisfied. We’ve liked the Huggies wipes. They are thicker and sturdier than the generic wipes. The generic wipes are perfectly acceptable, and we’ve used these too. MISSION SUMMARY – Friends, when it comes to generics vs. name brands, you have to shop smart. 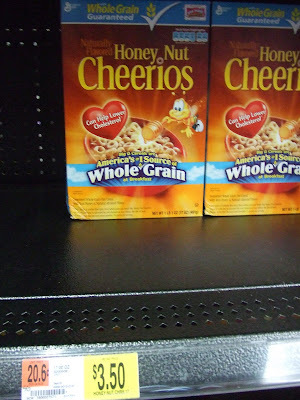 Sometimes stores try to trick you and it would appear that the same volume of a product in generic is cheaper than the name brand, but what is often the case is that the box sizes are misleading – so measure price to ounce. 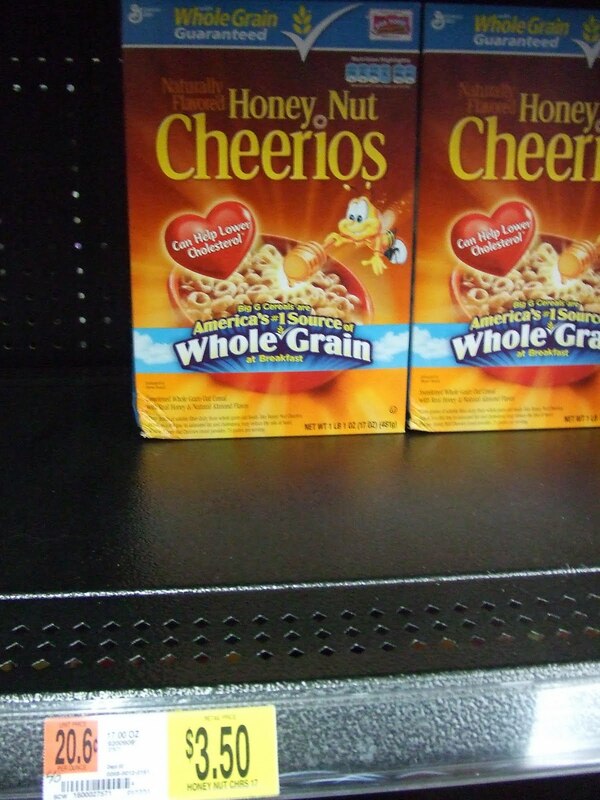 Also, it is often the case that when priced out, the name brand can be cheaper or equivalent. And, you must be mindful of your preference on taste and quality. Sometimes you can’t tell the difference, sometimes you get what you pay for. Bring your coupons, bring a calculator, and you’ll be able to find the best loot for your galleons. I was amazed at some of the things in this post - mostly the contact solution. I buy complete now - about $12/2 bottles! But now I am definitely interested to try the Up & Up brand. I actually really like the Up & Up brand and use the diapers for my son. They are SUPER absorbent (he can wear one all night!) 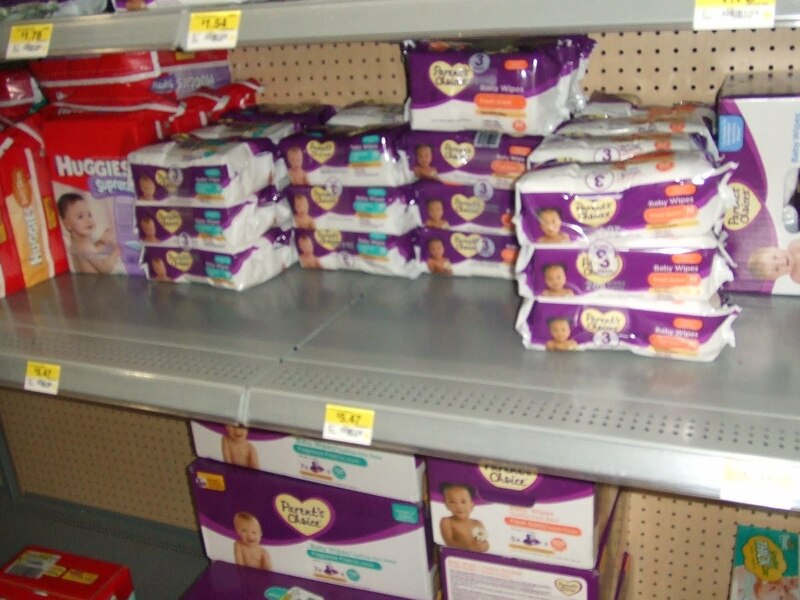 and much cheaper than Pampers or Huggies - especially with the Up & Up diaper coupon! Thanks! Great post Ethne!! I love to compare name brand to generic and house brands!! 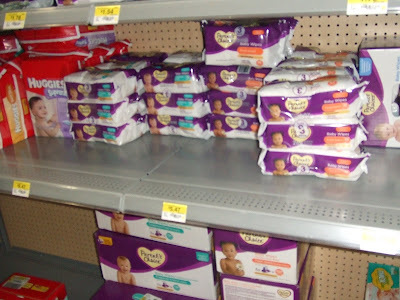 I too am a fan of the huggies unscented, and just recently found that Dollar General has the BEST compare to huggies unscented!! They aren't the cloth like ones that walmart and target's generic have. They are thick and really just like the Huggies! !